Think you’re the only superhero in the world? Mr. Stark, you’ve become part of a bigger universe. You just don’t know it yet” said Samuel L. Jackson’s character Nick Fury at the end of 2008’s Iron Man and sure enough he was right. Since then, the MCU (Marvel Cinematic Universe) has indeed expanded its catalogue of superheroes for their big-screen endeavors, crafting feature films around several iconic comic book characters from fan-favorites Steve Rogers (Captain America), Bruce Banner (The Hulk), and Thor to lesser known ones like Scott Lang (Ant-Man) and The Guardians of the Galaxy. What may have ended up as a one and done deal, Marvel Studios has created a very profitable empire with the MCU, spanning so far with 13 movies within three film sagas (so far), with their recent blockbuster Captain America: Civil War grossing over 1.15 billion at the worldwide box office. Now, with Marvel continuing to be the powerhouse of superhero movies, the studio now unveils its newest cinematic movie (14th to be exact), entering the strange and mystical realm with the film Doctor Strange. 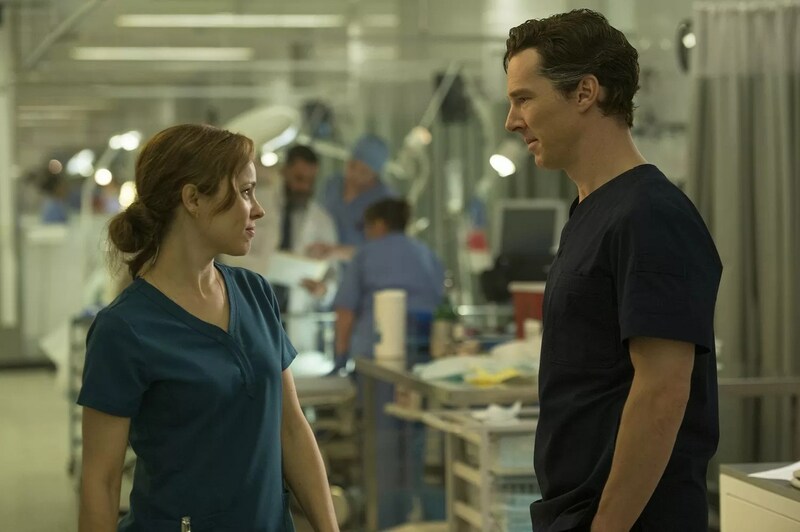 Does this latest superhero installment bring the MCU’s signature thrills and excitement or is the multi-universe / mysticism of the good doctor too strange for the average moviegoer? Dr. Stephen Strange (Benedict Cumberbatch) is a prolithic hotshot neurosurgeon who performs marvels with his mind and hands, saving lives from certain death due to medical complications. Rich, arrogant and too self-absorbed to maintain a relationship with fellow surgeon Christine Palmer (Rachel McAdams), Stephen remains in his own personal world of ego and luxury, only to lose it all in one fell swoop after surviving a horrific car accident, which robs of the use of his hands. In his feverish search for rehabilitation in his hands, Strange spirals downward, hitting rock bottom when nothing is able to help, turning to a rumor when he hears the miraculous tale of a man named Jonathan Pangborn (Benjamin Bratt), a paraplegic who learned to walk again. Journeying to Nepal (on Pangborn’s word), Strange seeks help from the one called “The Ancient One” (Tilda Swinton), a powerful mentor who resides in the secret compound Kamar-Taj, able to teach her pupil in the ways of the mystical arts. Refusing to believe in the Ancient One’s teachings (at first), Strange gives in, embarking an enlightening study, learning about astral dimensions and the possibilities to manipulate energy to his will. 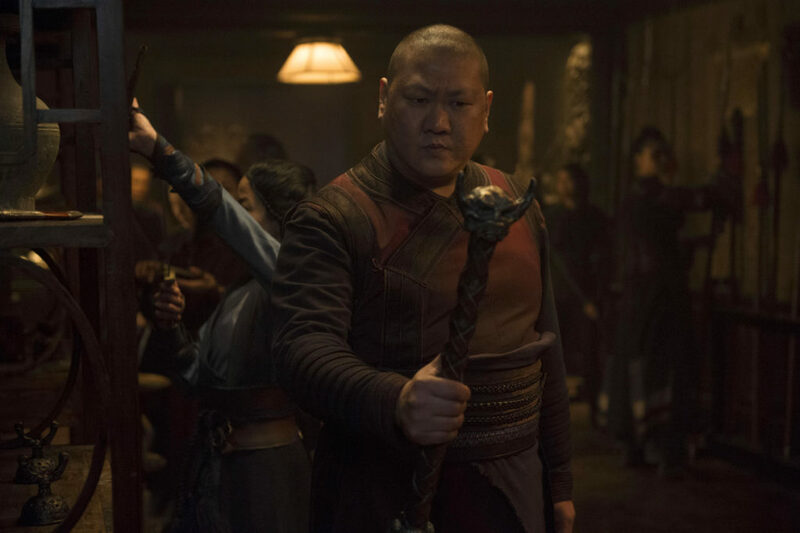 Aiding Strange to hone his skills and knowledge are Karl Mordo (Chiwetel Ejiofor), a student of the Ancient One, and Wong (Benedict Wong), Kamar-Taj’s steadfast librarian. 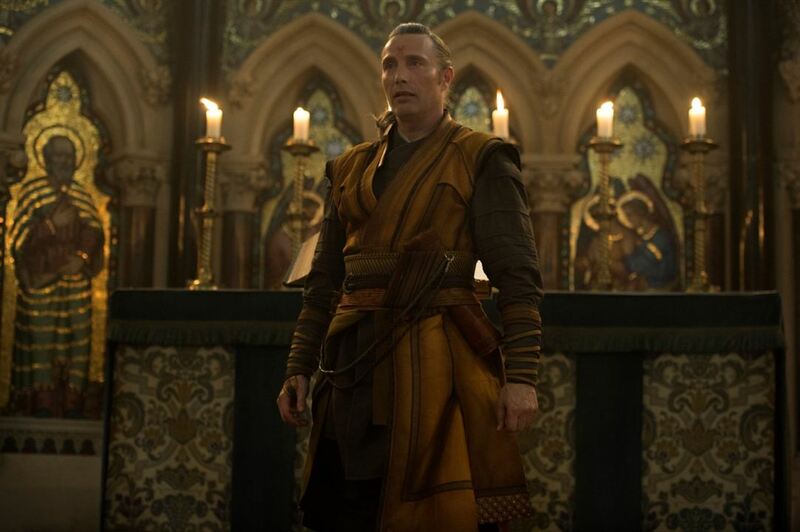 Through study and practice, Stephen eventually is put to the test when Kaecilius (Mads Mikkelsen), a former student of the Ancient One, appears, challenging her with stolen forbidden knowledge and malevolent acolytes. If you have been following my blog and my movie reviews, it’s pretty obvious to tell that I’m huge fan of the MCU films (see my reviews for Guardians of the Galaxy, Avengers: Age of Ultron, and Captain America: Civil War). Thus, my expectations and overall excitement have grown with each release of the newest MCU superhero feature film. With Civil War opening up the cinematic universe’s Phase III saga, it set the bar high for where Marvel will take their arsenal of superheroes next. This ultimately leads into Doctor Strange, the 14th installment of the MCU and the 2nd movie in its Phase III saga. I remember when they first announced the Doctor Strange movie I was a bit intrigued by it, but I hardly didn’t know that much about the character. I’ve did some minor comic book research on Strange before the release the first trailer for the movie, so I understood the main reason behind Strange (i.e. him getting in an accident, journeying to Nepal, and meeting the Ancient One, etc.). As for the movie, after seeing the trailers, I was pretty excited to see this movie (even ranked in my “Top 15 Most Anticipated Movies of 2016), especially since the trailer showcased the film’s visuals and its recognizable cast. Well…. what did I think of it? To me, despite some commonplace negative familiars, Doctor Strange is a good origin story, allowing the movie to open a new realm of mystical magic for the MCU to explore. It may not be the ultimate best, but it still definitely worth the trip “down the rabbit hole” (if you catch my meaning). Bringing magnificent Doctor Strange to the big screen is director Scott Derrickson, who previous work includes The Day the Earth Stood Still (2008 version), The Exorcism of Emily Rose, and Deliver Us from Evil. Giving those movies and the rest of his directorial features, Derrickson plays around more the horror genre, making Doctor Strange his first big-budgeted studio blockbuster endeavor that’s mean to appeal to a more wider range of viewers. In truth, Derrickson has a unique opportunity to expanded into uncharted territory within the MCU, opening the doors to us (the viewers) to explore otherworldly horizons beyond the physical world. In that, Derrickson succeeds, balancing the movie’s tones of being different, setting itself apart from other MCU installments, while also establishing itself as being a solo movie endeavor. Truly, Doctor Strange is different and Derrickson seems to relish with that knowledge, providing plenty of visual distractions and supernatural frivolities to make this film have a slight breath of fresh air. Personally, just like what I said about Guardians of the Galaxy and Ant-Man, it’s nice to see that Marvel is introducing new characters within the MCU and not just another Iron Man or Captain America movie or another superhero team feature. Perhaps one of the greatest strength for the movie is within the film’s visual effects. With all the talk of magical properties and bending reality, I kind of assuming that the movie was going to be heavy on visual to showcases these nuances. To its effect, it works and works beautifully. The visuals are truly great and are top-notch, adding and enhancing to the movie’s mystical world. It can be a bit trippy at times, with blending and mesmerizing kaleidoscope of objects and color and the usage of bending of the perception of reality in an Inception-esque style visuals. So, as a cautionary warning, I wouldn’t recommend seeing Doctor Strange if you’re prone to having photosensitive epilepsy or in the case of being under the influence (drunk or high) or you’ll be definitely tripping if you do so. In addition, in terms of production / filmmaking, Doctor Strange is a well-crafted film from its production layout, art direction, costume design, various camera angle shots. The musical score, in which I usually do mention and is composed by Michael Giacchino, is good, but nothing truly grand or to rush out to buy / download the soundtrack for. Unfortunately, Doctor Strange, with all its visual wizardry, cannot escape from being problematic to itself. Perhaps the most notable problem with the movie is the type of superhero movie it is. For all tense and purpose, Doctor Strange is an origin story, introducing Steven Strange to the mystical world and how he becomes a superhero of sorts (the Sorcerer Supreme). While this is interesting to showcase the transformation of Strange from man to wizard (sort of speak), the narrative structure of Doctor Strange is conventional, following the well-trodden path of familiar origin story scenarios. As I said, this movie is the 14th installment in the MCU and with those tales of superheroes and their origins are laid out, Doctor Strange does fall prey to following the standard formula and predictably of these films. Nothing truly bad, but still nothing really original or surprising. In truth, Doctor Strange follows a similar path to 2008’s Iron Man; introducing a character who is rich, brash, and arrogant, who (under the circumstances) gets brought down a peg or two and undergoes a rebuilding process, becoming powerful and trying to solve his inner conflict within. Another problem is that Doctor Strange is a bit out there (weird) than other MCU movies. While I did say that the film is to be celebrated for being different, it might be a bit too different for some viewers, bringing forward all “strange” nuances that makes feature feel more like sci-fi movie (i.e. other dimensions, astral projections, an evil entity that lies beyond time, the power to manipulate time, etc.) than a standard blockbuster superhero adventure. To me, this didn’t bother me as much, but I’m stating the fact as the average moviegoer might not be fully ready to explore the strange brave new world of Doctor Strange. Perhaps one of the crucial components in Doctor Strange is Doctor Steven Strange himself and Marvel has done it again by casting someone great to play the film’s main protagonist. Actor Benedict Cumberbatch, known for his roles in The Imitation Game, BBC TV show Sherlock, and The Hobbit trilogy, plays the Doctor Strange and he sells it beautifully. To me, it is a bit of a somewhat of a surprise that Cumberbatch accepted the role of Strange as he mostly plays dramatic / Oscar-worthy type roles much more so than a Marvel superhero. However, the character of Steven Strange seems a perfect fit for Cumberbatch, with the actor playing to his strength of wit, charm, and arrogance. He also adds enough nuances and humor to Strange, imbuing the character with a relatable / likeable quality, much like the rest of the other central Marvel heroes. And, of course, being a veteran of the dramatic arts, Cumberbatch can also handle all the dramatic moments that is required in the movie. 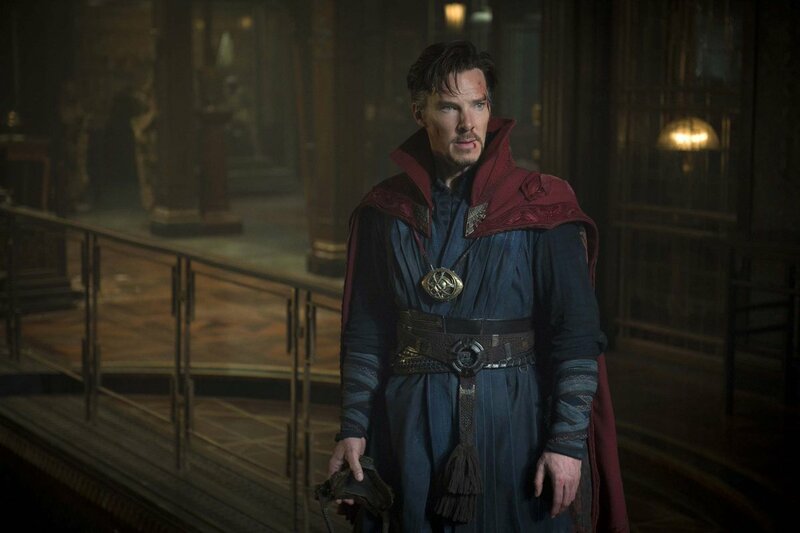 All in all, Benedict Cumberbatch’s Strange pulls it all off, the costume (his looks incredibly awesome the cloak and all), the facial look, and the overall introduction to the MCU’s more zany supernatural world. Besides Steven Strange, the character of the Ancient One is probably most developed in the movie, providing enough momentum for story narrative and palpable lessons for student-master relationship. Playing such a titular character is actress Tilda Swinton, who has talented individual in her roles (still love her as the White Witch from The Chronicles of Narnia: The Lion, The Witch, and the Wardrobe). Of course, some fans / moviegoers will undoubtedly express their opinions on Derrickson’s choice (or even Marvel’s decision) to employ a Caucasian white actress in a more traditionally Asian role. That being said, Swinton is terrific in the role and presents a multifaceted and layered role in the Ancient One, a blending mixture of being ominous, skilled, insightful, and tormented, but still a human character. Personally, behind Cumberbatch’s Strange, Swinton’s Ancient One is second favorite character in the movie, joining the ranks of prolithic actors / actress to star in a Marvel movie (i.e. Anthony Hopkins, James Spader, Robert Redford, Glenn Close, Michael Douglas, etc.). In the going trend of Marvel villains, the role of Doctor Strange’s baddie (Kaecilius) follows that same trend of being casted by a great actor, but ultimately is a weak antagonist in the film’s grand scheme of things. Played actor Mad Mikkelsen, who does usually the play villain in most of his roles (due to how he looks and speaks), Kaecilius is a tad bit more rounded than just a power-hungry bad guy, given his reasons behind his motivations, but as the film’s events unfold, he becomes more of a dull / blunt tool rather than a villain you love to hate. To his credit, Mikkelsen does a good in the role, being an imposing figure of villainy (definitely looks the part) and dishing out the lines to back it up, while also have a couple of jokes, which are a bit funny due to his straight-face and monotone demeanor. Still, at the end of the day, Mikkelsen’s Kaecilius is just another bland bad guy (played by a good and talented actor), with Marvel still can’t nail down a fully well-rounded villain, with the exception of Tom Hiddleston’s Loki or maybe James Spader’s Ultron. With Doctor Strange being an origin story, the narrative is mostly focused on him (Strange) undergoing the transforming from arrogant neurosurgeon to broken man to student and to a fully realized Sorcerer Supreme, and all the complexities in-between. This, of course, mean that there not a whole lot of room for the film’s supporting cast to be clearly defined, but are still played by some great and respectable actors. This includes, 12 Years A Slave actor Chiwetel Ejiofor, who plays the ever-vigilant Karl Mordo and The Martian’s Benedict Wong, who plays the stern, no-nonsense librarian Wong. Both are talented individuals, but are mostly used for foils to be used to help define / strengthen the character of Steven Strange and frame the story’s events. However, I do have to say that Wong’s Wong (ha-ha…sound confusing when you say it like that) does have a few scene-stealing moments that are great. Then there Rachel McAdams’s character of Rachel Palmer. Like the others, McAdams is a good actress, but the character is weak, only serving moments to help define Strange and his struggles. Furthermore, while I’m not saying that both Cumberbatch and McAdams have chemistry together, it’s just I don’t see them being a romantic couple. Some of these are just minor quibbles as I didn’t expect them to fully explored in this first movie. Hopefully they’ll further explored in Doctor Strange gets a sequel. Rounding out the cast (in smaller cameo-like roles) are Benjamin Bratt as Jonathan Pangborn, a recent paraplegic who miraculously can walk again, Michael Stuhlbarg as Dr. Nicodemus West, a surgeon colleague of Strange, Scott Adkins as Lucian, one of Kaecilius’s zealot followers, and, of course, it wouldn’t be a Marvel without Stan Lee cameo (be sure to look out for it). Lastly, I did see Doctor Strange in theaters in IMAX 3D (well…technically Regal’s RPX 3D, which is kind of the same thing). While most movies of today are not worth the extra cash to see it on a large format screen or in 3D, Doctor Strange is the exception. As said already talked the film’s stunning visuals, the 3D effects work great with it and the large screen does help showcase the full magnitude of it effect shots. So, in case you’re wondering, definitely see it in 3D or IMAX 3D (if you can). As final (final) note, in the tradition of Marvel superhero movies, stay tuned for two Easter eggs scenes (one mid-credit scene and one post-credit scene). Without spoiling it, the first one is a bit funny, setting up events for another MCU movie, while the second (potentially) set ups events for another installment for Strange. The Marvel Cinematic Universe gets strange with mystical arts and the introduction to the multi-universe in the new movie Doctor Strange. Director Scott Derrickson newest film takes viewers on a wild and sometimes “trippy” ride through Strange’s introduction to this fantastical world. The visuals were extremely impressive and the cast was solid, especially Cumberbatch and Swinton. Unfortunately, the movie can’t escape the familiarity pitfalls of past MCU features, noticeably in its origin story plot points, its characterization, and an underwhelming villain, which (in all) fails to make the movie rise of its betters. Personally, I like it. It wasn’t my absolute favorite MCU movie (that’s still held by Guardians of the Galaxy and Captain America: Civil War) and it did have some problems, but the movie was still enjoyable and a great addition to MCU’s catalogue of superhero features. Thus, I will still say that Doctor Strange is highly recommended, for fans of Marvel (and its cinematic universe), Benedict Cumberbatch, or just big blockbuster features. With the good doctor’s origin story done and complete, Marvel now steps up the character to join the rest of its characters in Avengers: Infinity War (can’t wait to see Cumberbatch’s Strange along Downey’s Stark). For now, though, Doctor Strange offers up an expanded view of MCU while crafting a magical realm for Strange’s introduction tale. And, for what it’s worth, it’s nice to see a new Marvel character come into focus. You finally got to watch it! Oh I’m SOOOO looking forward to seeing Benedict with the rest of the crew, I think it’s going to be amazing! The scene with Thor just made me so hyped! Great review!! I’m a blogger and a reviewer, so I have to say that you have some great content! I think any origin story has one job to do: Can it get us interested in seeing more of the character? If so, it is a success. I want to see more of Doctor Strange, in his own movies and in ensembles. For comparison’s sake, while I found Ant-Man enjoyable, I’m not looking actively towards his next solo installment. He may be better as a pure ensemble character. Great review. Thanks for the comment. Totally agree with you. I am looking forward to the next involvement with Doctor Strange (whether another solo movie or large superhero team up feature). Also agree with you on Ant-Man While enjoyable not looking forward to his next solo feature. Not at all. Everyone usually does come to a different opinion. And I did your review and you did make some pretty valid points. Thanks for the comment! Great review, Jason. I also enjoyed this film and think Cumberbatch did a fantastic job. He’s a great addition to the MCU and I can’t wait to see him in the upcoming installments. I posted my review today so if you want to get another viewer’s perspective give it a read. I’d love to get your feedback. Yeah, there! Thanks for the comment and the follow. Will definitely look at your review! Looks pretty good, more interesting then most of Marvel’s output nowadays anyway. Yeah, its definitely interesting movie. The film’s visuals help aid in that endeavor, along with Cumberbatch’s performance. Reblogged this on heart1001 (e-motions & movies).